Western Hydroblasting UHP hydroblasting system is rapidly changing how highways, roads and airport surface maintenance is performed. No other pavement marking and rubber removal system, available today, is as productive or versatile as our SH 8000. The SH 8000 is equipped with a 45 litre per minute 40,000 psi (2757 bar) ultra high pressure pump with an operating range of 10,000 to 40,000 psi. Water flows to the pump and then to the blasting heads from a 10,200 litre (2250 gal) stainless steel tank, allowing for up to 4 hours of continuous operation. The dual hydraulically operated 10″ or 14″ blasting heads are where the work is actually performed and there are a series of spray bars and specialized nozzle patterns designed for each removal or cleaning application. 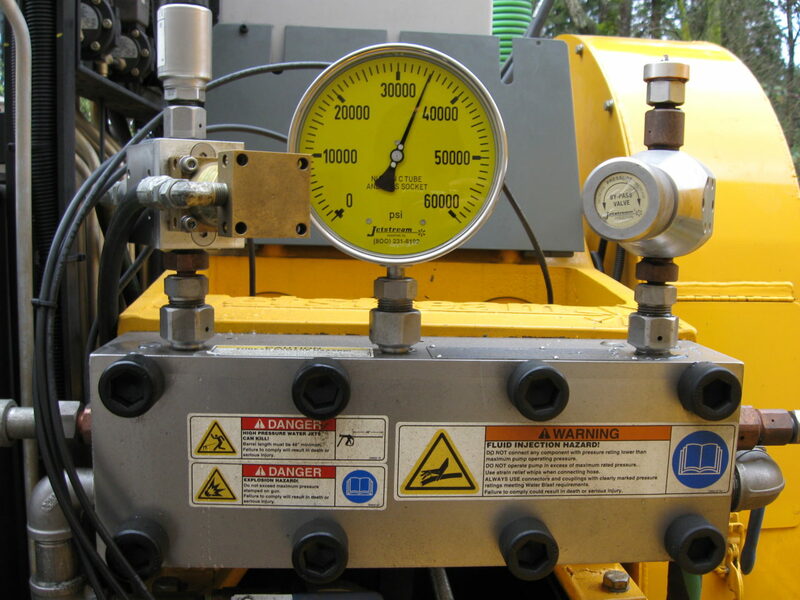 By arranging the blasting heads in an in-line or tandem configuration and choosing between 6″, 8″, 10″ or 14″ spray bars we have the flexibility to blast anywhere from a 6″ to a 27″ blasting path. The recovered debris and blasting water are separated in the 5200 litre (1375 gal) debris storage tank. The solid debris is held in a 2.5 cubic metre cloth filter bag and the water is separated and filtered to 100 microns. The ability to easily dispose of the recovered water without having to simultaneously dispose of the solid debris means that we can work at multiple job sites without having to stop and dispose of the recovered debris. At the end of a job cycle the recovered solid debris is easily dumped in a nearly dry state. When additional flexibility is required, our manually operated walk-behind unit is readily attached to the SH8000 main system of our truck. 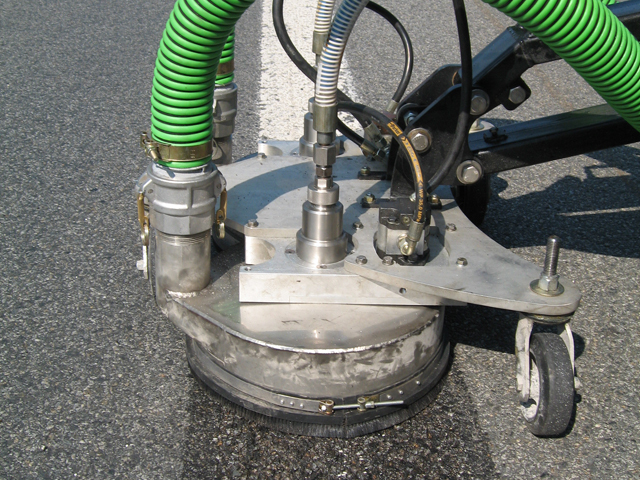 It removes all forms of painted pavement markings with a blasting head that can rotate spray bars from 6″ up to 14″. 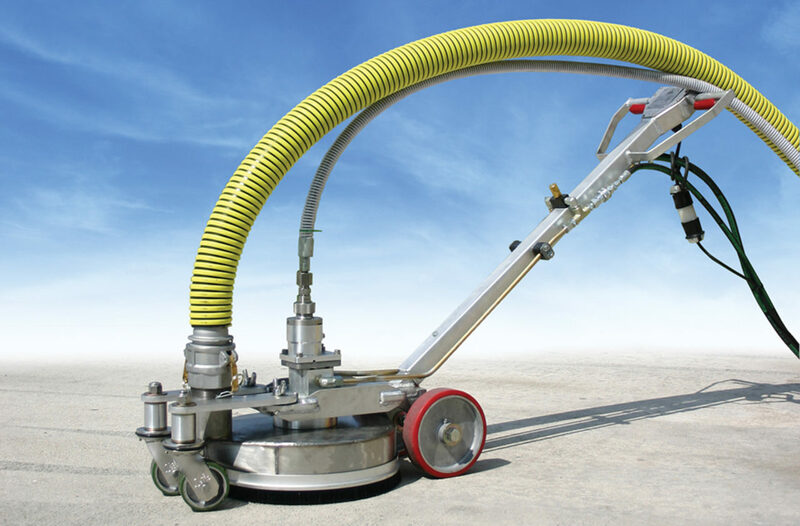 This unit allows for eradication in hard to reach areas and comes complete with simultaneous vacuum recovery.